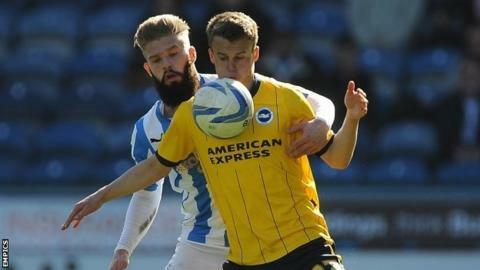 Brighton moved into the Championship play-off places after coming from behind to draw with Huddersfield. The Terriers led after six minutes when Oliver Norwood beat Tomasz Kuszczak with a free-kick from 25 yards. Kuszczak kept his side in the game after the break by pulling off a good save from another Norwood free-kick. And Bruno Saltor scored an equaliser for the Seagulls with seven minutes left after a defensive error from Huddersfield. The result was enough to take Brighton above Reading and into the top six with three games remaining, although Ipswich could go above them if they beat Watford on Saturday. Huddersfield, who have not won in 10 matches, are seven points above the relegation zone with four games remaining. They took an early lead when Norwood drilled home a free-kick after Keith Andrews fouled Nahki Wells. Brighton's top scorer Leo Ulloa had the chance to level and duly put the ball in the net, but his header was ruled out for a foul. After the break Lewis Dunk fouled Adam Clayton and was lucky not to be shown a second yellow card, with Kuszczak denying Norwood from the resulting fee-kick. The keeper was also needed to save from Adam Hammill and then used his legs to keep out Sean Scannell's attempt. Craig Mackail-Smith twice went close with headers for the visitors, who had captain Gordon Greer booked with 13 minutes to go when there was an altercation as he tried to retrieve the ball from the Huddersfield bench. There were late chances at both ends - Wells and Scannell forced saves from Brighton keeper Kuszczak and Dunk had a header saved by home keeper Alex Smithies in injury-time. Huddersfield manager Mark Robins: "On balance, I have to be happy with a point but we could have had all three. I was pleased with the application and the steely way we set about our jobs. "If we had taken another of the chances we would have been all right. We have been creating chances all season but just not been clinical enough. "We said we needed four points from the Easter weekend fixtures, so we have to go to Yeovil on Monday and win. They are fighting for their lives but we have the players who are capable of going there and getting three points. Brighton assistant boss Nathan Jones: "We are delighted to be still in the mix with three games left. "We always knew we had a competitive squad with everyone fit. We had an injury list that would have crippled even Manchester United, Chelsea and Manchester City. "This is a fantastic club. It's a Premier League club in terms of set-up and ambition. The difficult bit is getting there on the pitch." Foul by Calum Woods (Huddersfield Town). Substitution, Huddersfield Town. Harry Bunn replaces Adam Hammill. Adam Clayton (Huddersfield Town) wins a free kick on the left wing. Substitution, Huddersfield Town. Oscar Gobern replaces Sean Scannell. Attempt saved. Lewis Dunk (Brighton and Hove Albion) header from the centre of the box is saved in the centre of the goal. Assisted by Bruno. Goal! Huddersfield Town 1, Brighton and Hove Albion 1. Bruno (Brighton and Hove Albion) right footed shot from the centre of the box to the bottom left corner. Assisted by Lewis Dunk. Attempt blocked. Solly March (Brighton and Hove Albion) left footed shot from outside the box is blocked. Assisted by Craig Mackail-Smith. Attempt saved. Nahki Wells (Huddersfield Town) right footed shot from outside the box is saved in the centre of the goal. Assisted by Sean Scannell with a headed pass. Corner, Brighton and Hove Albion. Conceded by Anthony Gerrard. Gordon Greer (Brighton and Hove Albion) is shown the yellow card. Attempt missed. Dale Stephens (Brighton and Hove Albion) right footed shot from a difficult angle and long range on the left is just a bit too high from a direct free kick. Craig Mackail-Smith (Brighton and Hove Albion) wins a free kick on the left wing. Foul by Anthony Gerrard (Huddersfield Town). Attempt missed. Craig Mackail-Smith (Brighton and Hove Albion) header from the right side of the six yard box is close, but misses to the right. Assisted by Dale Stephens with a cross following a corner. Corner, Brighton and Hove Albion. Conceded by Murray Wallace. Oliver Norwood (Huddersfield Town) is shown the yellow card. Foul by Adam Clayton (Huddersfield Town). Attempt missed. Craig Mackail-Smith (Brighton and Hove Albion) header from a difficult angle on the left is close, but misses to the left. Assisted by Solly March with a cross following a corner. Corner, Brighton and Hove Albion. Conceded by Paul Dixon. Corner, Brighton and Hove Albion. Conceded by Calum Woods.